Keep an eye out for colour rings on these Daz-whites as they dash along the tideline. On the 10th of September, three colour ringed Sanderling were spotted among a flock of 208 on Sandymount Strand, doing the usual Sanderling thing – zipping along right in front of the waves, like clock-work toys in fast-forward. All three birds were ringed in Iceland in 2011, and have wintered in Ireland every year since! 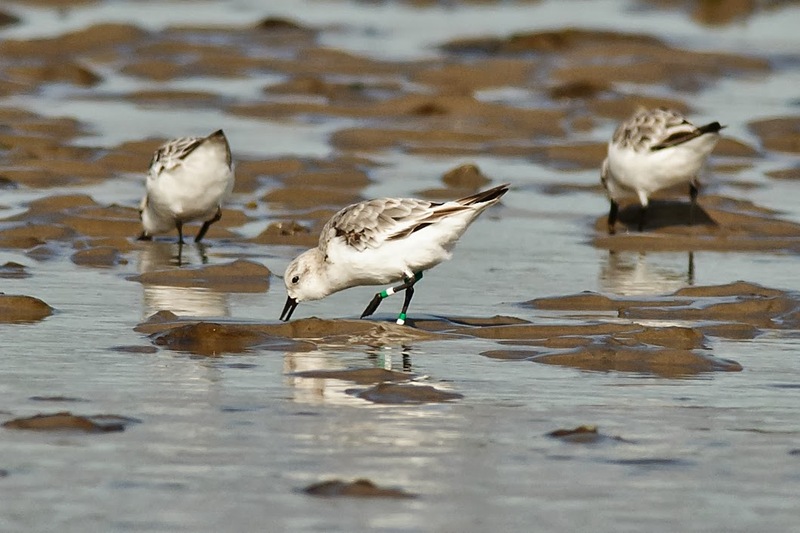 Overview of Sanderling re-sighting locations in Dublin and Iceland. 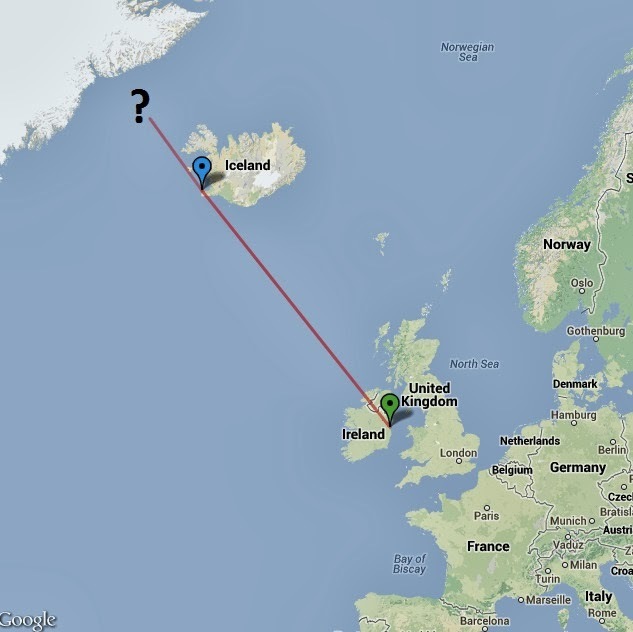 G1RWGR was ringed on the 18th May 2011 in Sandgerði, and was last seen in Iceland on the 25th May 2011. He was picked up again in Poolbeg in Dublin Bay on the 31st July 2011, where he spent the winter, having his rings read numerous times between then and the 24th April 2012. 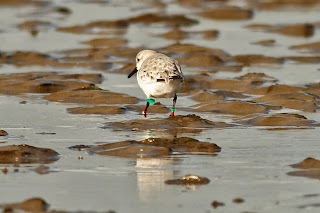 The next sighting of G1RWGR was on the 30th July 2012, back in Poolbeg once again. 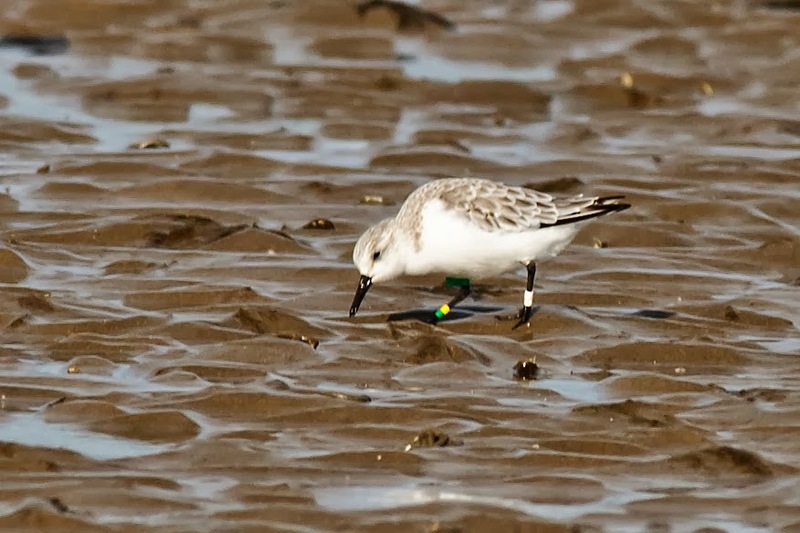 Sanderlings don’t breed until they are two years old, so this guy wouldn’t have made the trip all the way the breeding grounds in Greenland or Canada in 2012. It’s likely that he did breed this year however, having last being seen in Dublin Bay on the 25th February and not being picked up again until the 10th September. Here's a quick summary of the re-sightings for the other two birds. The numbers of waterbirds in Dublin Bay are still building, but as we wait for the big numbers to arrive, we shouldn't overlook what’s already here. 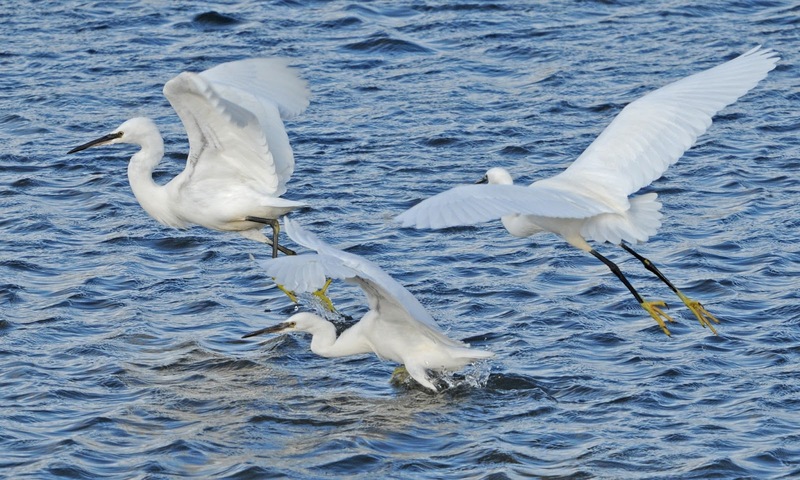 Just north of the Bull Island causeway, you’ll often find an aggregation of Little Egrets – we've had up to 31 while out doing surveys recently. With their beautiful white plumage and diagnostic yellow ankle-socks, these small herons are the better looking cousin of the better known and more widespread Grey Heron. 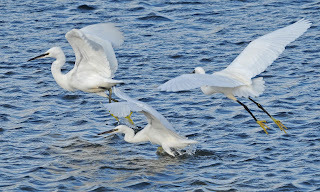 These guys are recent arrivals from the Continent– 20 years ago such an aggregation would have resulted in hundreds of birders racing to see them – but we’re getting used to them now. That said, the Little Egret’s beautiful white plumage and their characteristic little chases after prey in our wetland pools are well worth stopping to take a look at. Grey Plover. Richard T. Mills. 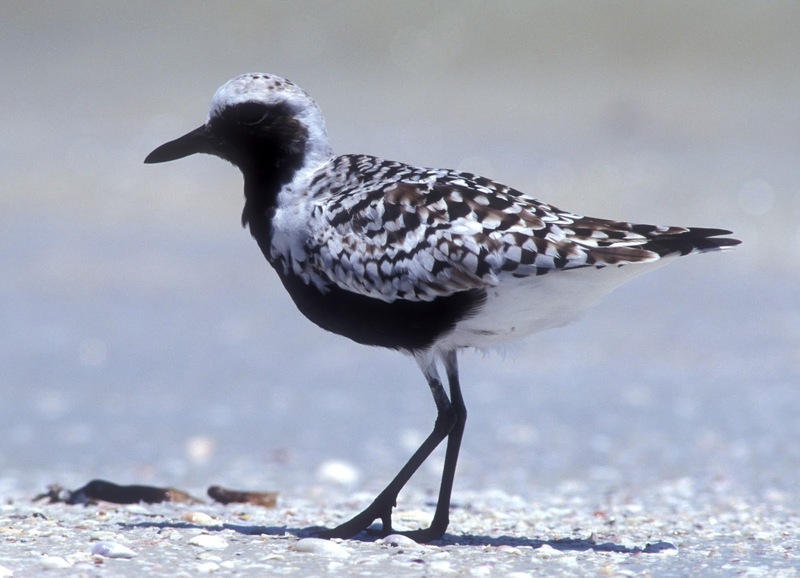 Also worth looking out for are the beautifully contrasting summer plumaged Grey Plovers – spotted black and white upperparts and black underparts with a white border. As their winter plumage takes over in the coming weeks, the drab factor will increase, and we’ll just be looking out for their black “armpits” (if you know what I mean!) to distinguish them in flight. 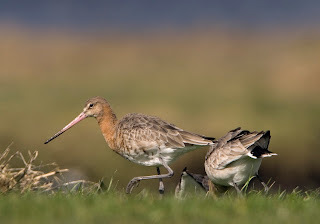 And how can I talk about beautiful summer plumaged waders without mentioning Black-tailed Godwits! This rusty-orange plumage stands out wonderfully from the browns and greys of the mudflats. Enjoy this beauty when you can, because like the Grey Plover and the others, it will soon fade. Don’t worry though; a host of colourful ducks have just arrived to provide another splash of colour to the mudflats. 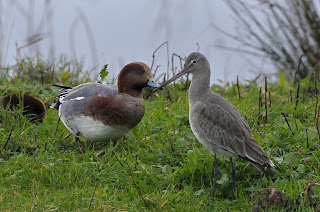 A Black-Tailed Godwit in winter plumage, with a Wigeon. They say that one Swallow doesn't make it summer, but, for me anyway, the arrival of the Brent Geese does make it winter. And this week, 800 of them have been reported in Strangford Lough, Co. Down, so it’s official! Birders in north county Dublin report that there are no geese present on the Rogerstown or Broadmeadow/Swords estuaries just yet, but that a single pioneering goose has been seen just inside the county border on Gormanston beach. As more and more of these birds arrive in Ireland from their breeding grounds in the Canadian Arctic, they will filter down along the east coast and into Dublin Bay. inscription, right leg ring colour, left leg ring colour). Paddy Dwan. 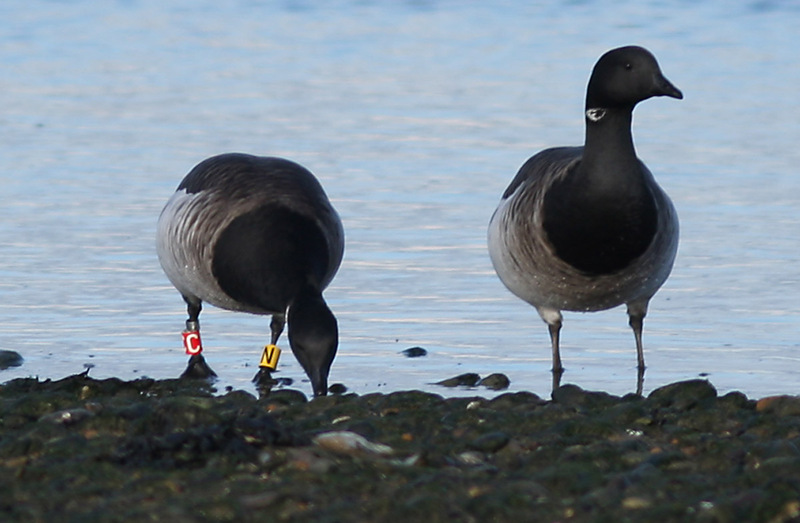 This population of geese is remarkably well studied, and the Irish Brent Goose Research Group have colour-ringed lots of them over the years. Ring reading, by what is now an army of dedicated amateur ring-readers, allows information on movements, site fidelity and survival to be collected. Even the social structure of this population is being studied. This will help to understand how an individual’s social standing affects its physical condition and survival. of Dublin in the winter. Matthew Silk. Ultimately, all this work will highlight the factors that have the greatest influence on Brent Goose ecology and will feed in to future conservation actions for the species. So, when these birds turn up in Dublin Bay in the coming weeks, why not get out and see if you can see some colour-ringed ones? Any ring-reads (including the date and location) should be sent to grahammcelwaine@btinternet.com .